The object created on the 3d printer for metal from metallic powder near furnace for heat treatment synterization. Dental crowns created in laser sintering machine. DMLS, SLM, SLS technology. hd00:06The object created on the 3d printer for metal from metallic powder near furnace for heat treatment synterization. Dental crowns created in laser sintering machine. DMLS, SLM, SLS technology. hd00:06The object created on the 3d printer for metal from metallic powder is placed in furnace for heat treatment synterization. 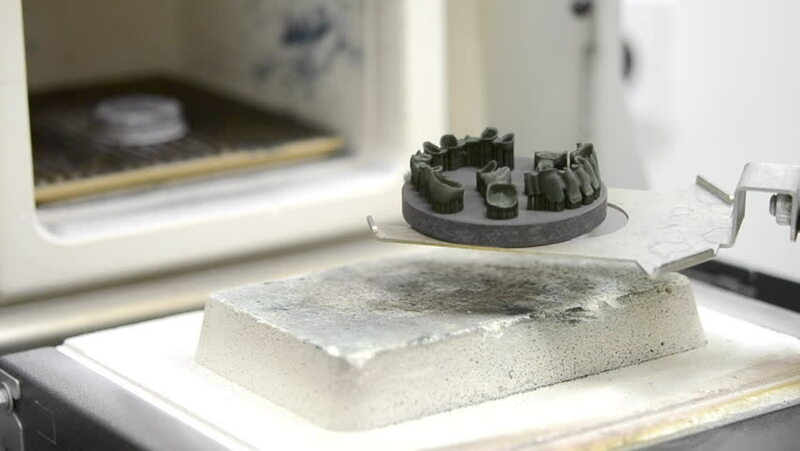 Dental crowns created in laser sintering machine. DMLS, SLM, SLS technology. hd00:23Step by Step. Making homemade gluten free sugar Hanukkah cookies. hd00:29Work of an industrial surface grinding machine. Grinding of a flat metal part. Sparks fly out from under the grinding wheel. Grinding with a coolant.